A pathological liar lies compulsively and impulsively almost without thinking about the consequences. Pathological lying is likely to occur with people who suffer from certain personality disorders. 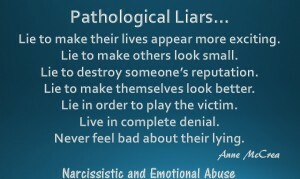 Narcissists are skilful liars who tell lies in order to hurt and harm everyone who comes into their lives. They also tell the truth in misleading ways to give others incorrect perspectives. They study the person they hope to take advantage of looking for signs of weakness. Liars don’t care about your feelings and never will. A pathological liar shows no emotion when lying which is why they are so often believed. Many have been known to beat a polygraph. A phoney, a liar and a loser. Some scientists believe that narcissists lie in order to get attention, to make themselves appear more interesting. In fact, some will even tell lies that are self incriminating. Some narcissists lie in order to paint themselves as a victim to gain sympathy. People with low self esteem are more likely to resort to pathological lying in an effort to make themselves look better than they believe themselves to be. When caught out on their lies, narcissists often become extremely defensive and try to blame others. They may fabricate more lies to cover up the original lie. Some react with anger and rage and may retaliate. 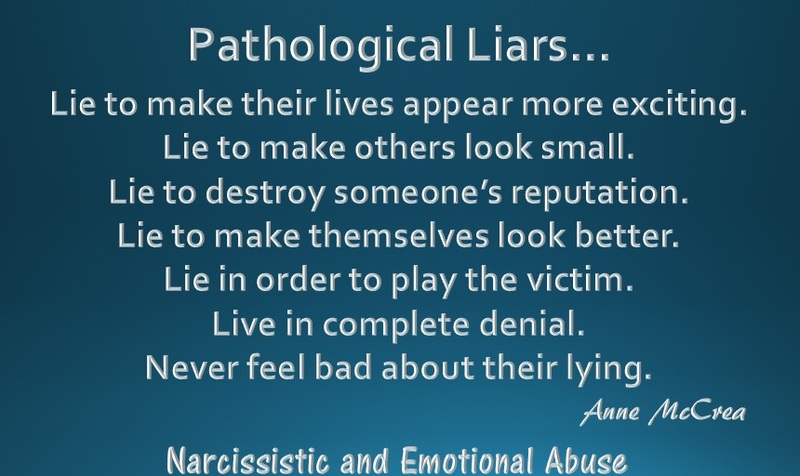 Pathological liars often have difficulty maintaining consistency in their lives and often cannot sustain healthy relationships and become estranged from their families. They do not appear to learn from their mistakes and probably never will. Wow. This is so my ex. He has fooled so many people it’s unreal. I just hope one day my son will see it for himself. Wow I have two sisters just like this, one of them has created so much misery with family, could sell snow to Eskimos . I laughed in his face! You just can’t help it sometimes. He knew all my insecurities he put there and he played them all the time. I got help from a Psychologist though. She turned it all around for me. Now that I look back at it I see that the bulk of my anger was not at him, it was at ME! At me for reacting to him and giving him all my power. After all, that is what they live for! A reaction is a victory to them. try not reacting …..they have to resort to more serious means then. My therapist said it like this…..Imagine a little pouch you carry on your side. It is filled with all YOUR personal power. ( there is no power in reality, only in a Narc’s head) Every time you react to him , you reach inside your pouch and give some of your power to him for his pouch. After awhile of doing this you have no power left. But, he still needs to steal imaginary power from others in order to survive. So he goes out and finds a new source of supply. When he sees you have built yours back up again , he will try and giggle your pouch to see whats in there. Don’t let him near your pouch. Id be very interested if 2 narcs could br attracted and try and form a relationship. 2 Narcs are unable to form or maintain a relationship due to their main requirement of a constant supply. It is similar to a fire that requires oxygen to continue to burn…… Narcissists are the same, they can’t get a supply from the other so they are of no use to each other. The only time Narcs can form a ‘relationship’ or ‘friendship’ is if they have a common goal such as a business venture but even then they concentrate on what their individual/personal end goal is, which is usually to the detriment of the other person or people involved in that arrangement/venture. When things go wrong in the deal (because of their own inability to do their job or role in the venture [largely because they don’t know how too and try to cover their tracks]), the Narc blames everyone else for the venture going wrong by deflecting and not taking any responsibility. They bail leaving others to take responsibility for the financial, professional and emotional fall out and move on with their lives, with the exception of turning things around so that they look like they are the victim and hard done by. Because they didn’t know what they were doing it is easy to don the mask of the victim. They act stressed out by what has happenend and act incapacitated by the stress that they have been subjected too so that they can have time out or a ‘break’ so that they can use the people in their personal lives for support whilst being lazy and doing whatever they want to do i.e. going to lunch, using other people for a financial source whilst they work out what they are going to do next (work wise), indulge in substances such as alcohol and drugs, having or withholding intimacy, becoming aggressive unnecessarily and the list continues. They treat their relationships/friendships with fellow Narcs in the same way they do Empaths i.e. use them for what they can get then discard. Narcs can spot other Narcs.